Neon is everywhere this Spring, and it turns out some of it looks better than others. I've seen people wearing it against lots of stark black and white outfits, and while the color does pop, watch out! Pull it off and you might look like a little ray of sunshine. But overdo it, and you're a walking Caution Cone. Yikes. As a general rule, little pops of neon in accessories always beat giant bending swaths around ones derriere (though if I saw the right skirt combo, I might just be persuaded...). With that in mind, and because I'm in a bracelet re-doing mode these days, I decided to reinvent these salvaged plain silver bangles that I've had forever and would most likely never wear again. Until now, anyway. Check 'em out. I wanted the silver to peek through here so I chipped the paint off while it was not entirely dry. 1. Take a stack of silver bangles and mask the inside so they are easier to handle/paint. 2. Spray paint with Krylon neon spray paints in yellow, orange, and cerise. Summer fun with navy and white stripes! 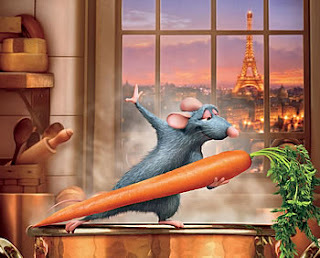 Ahh, Ratatouille! One of the best movies in the whole world, and who couldn't love rats after seeing how talented and cute they turn out to be?! I just made these totally simple rat ears and beret for a Prop. 37 commercial. Thought they would be a great last minute Halloween costume for any of you out there who might have a penchant for the gutter life. 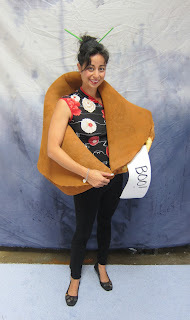 A perfect accompaniment for the Chinese To-Go Box Halloween costume. It's super simple and only requires a few ingredients. 1. Stain the board and let dry. 2. Gather up bark from pine trees and birch trees. A little goes a long way. We got so much in a matter of minutes and had enough extra to make another sign that said something else.